The pot of gold at the end of Reading Rainbow is somewhere in the neighborhood of $5.4 million. At the end of May, executive producer and host LeVar Burton launched the Kickstarter campaign in hopes of creating a Web version of the popular PBS show. He saw its initial goal of $1 million reached just hours after its launch. Now, some 28 days later, with more than 100,000 backers, Entrepreneur magazine notes that the campaign has broken the record for most individual contributors. On June 28, Family Guy creator Seth MacFarlane "pledged to match donations to the literary project up to $1 million," New York's Daily News notes. 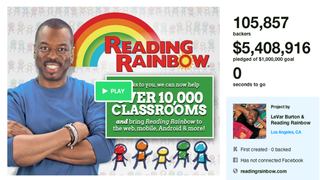 According to the Daily News, Reading Rainbow's crowdfunding campaign is the fifth-most-funded project on Kickstarter, and all four bigger campaigns have donated rewards to its efforts. Read more at Entrepreneur and the Daily News.